Prepare and bake cake according to package directions, using two greased 9-in. round baking pans. Cool for 10 minutes before removing to wire racks to cool completely. Cut one cake layer if necessary to fit evenly in an 8-qt. punch bowl. 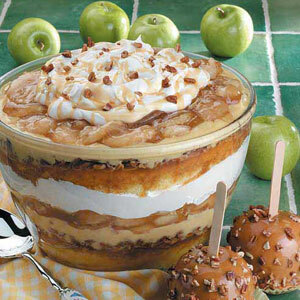 Poke holes in cake with a long wooden skewer; gradually pour a third of the caramel topping over cake. Sprinkle with 1/2 cup pecans and spread with half of the pudding mixture. Spoon one can of pie filling over pudding; spread with one carton of whipped topping. Top with remaining cake and repeat layers. Drizzle with remaining caramel topping and sprinkle with remaining pecans. Refrigerate until serving. Yield: 42 servings (3/4 cup each).